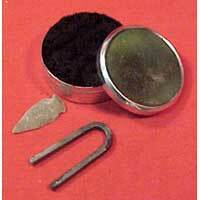 A small striker, flint and pre-made char cloth are packed in a handy tin. Striker measures 2-1/2" long; tin 2-3/4" diameter. Add your own tinder and you have a great fire set to fit in a hunting bag or pocket.